The English language is expansive and complex. The rules are always changing, and grammar advice from a century or even a few years ago may not apply today. If you want to communicate with clarity and credibility-if you want people to focus on what you're saying, rather than how you're saying it-then you need to use excellent grammar. Editor, linguistic expert, and self-proclaimed "grammar cheerleader" Lisa McLendon has spent her career finding ways to use language effectively and correctly. Lisa knows that the primary reason people are uneasy about writing and public speaking is because they aren't confident in their grammar skills. 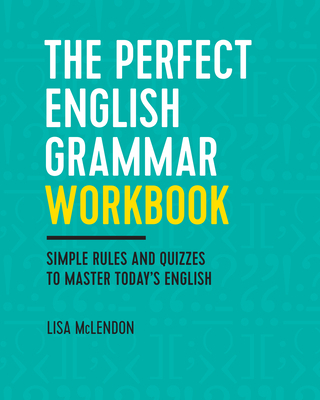 With The Perfect English Grammar Workbook Lisa has developed a simple, well-organized grammar workbook that demystifies English grammar so you can use it with confidence and accuracy. Lisa McLendon is the the author of the grammar blog madamgrammar.com. Lisa offers expert guidance on all things words, language, editing and the like. After getting a doctorate in Slavic languages, Lisa spent a dozen years on newspaper copy desks before teaching news editing at the University of North Texas, Friends University in Wichita, and Wichita State University. A member of the American Copy Editors Society (ACES) since 2000, Lisa has presented numerous sessions at national and regional ACES conferences, on topics such as grammar, punctuation, headlines and math. Lisa loves linguistic humor, proper use of the verb "comprise," and numbers that add up.